Just recently I was doing a lot of research on new mobile and phone accessories to get rid of my Nokia X6. It was a difficult decision to part ways with Nokia but the time had finally come. During my research while I was in the Mobile Store I was presented with many Android phones in the premium category and also the Nokia Lumia 800. 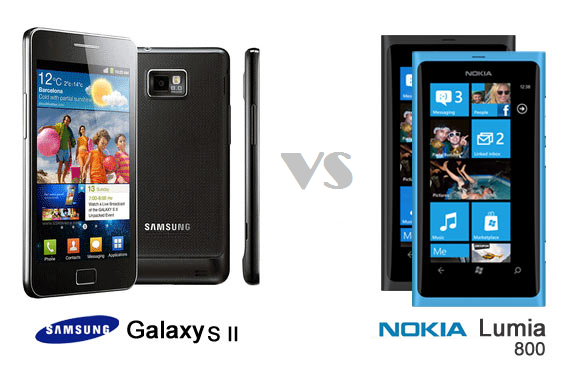 I finally shortlisted 2 smartphones Nokia Lumia 800 and Samsung Galaxy S2. I have to admit Nokia Lumia User Experience is really amazing and the touch interface is very buttery, smooth and very responsive. But I wanted to take the smart decision and I finally applied all my logic and did crude comparison. To Sum it up here is the comparison factors. Screen Size 4.3 " 3.7 "
Well the verdict is very clear but still there are few more limitations of Nokia Lumia 800 which really annoyed me. You cannot do Bluetooth data transfer like exchange music and videos with your friends. You have to add all the songs and Videos via software called Zune similar to iTunes. The above limitations are very restrictive and unpopular in Indian Smartphone users. Hence I took the hard decision and went ahead with Samsung Galaxy S2. You know what I downloaded a simple App which simulates Windows 7.5 tiled UI that's the power of Google Play market. You can consider buying Nokia Lumia only after a couple of years when the Windows Market becomes Apps rich and Nokia introduces Dual or Quadcore processor smartphones. Stay tunes for some amazing Tips and Tricks with Samsung Galaxy S2.